You rarely find as great a versatile player like Alaba that performs well on both back positions and as a midfielder. Zanetti was obviously one of a kind in terms of this and Alaba is clearly not on that level but he is still great and a bit underrated IMO. I'm sure people would rate him higher if he was able to do well in a big national team instead of Austria. I'd rather have a prime Alaba in my team than a prime Chivu. And I'd rather spend my time replying to someone who's familiar with the sport instead of you, but here I am. We never had prime Chivu as a left back anyway, so your compariosn is moot. Prime Chivu was a top 5 center back in the world in the 2000s among legends like Nesta, Samuel, Stam and Cannavaro. I just think he has been the same player he looked like becoming since Pep got there. His first few years at Bayern he was fantastic and looked like becoming the best right back in the world for the next decade. His form has dropped since then, but he's still one of the top left backs around. I have to disagree. In no universe Alaba is underrated. The austrian national team isn't very good that is not a secret. But when you have someone like him in the team, that is hailed like a talismanic figure by many many people (also by me btw) you should at least expect him to stand up for the team and give his best, not even talking about "carrying" the team. During the 3 games at the Euros 2016 where he was used as a midfielder, he showed some of the absolute worst performances I have ever seen from a professional footballer. Whenever he got the ball you already new he would give it away, either due to a bad dribble or a bad pass. He had by far the lowest percentage of completed passes in the entire team. 2 years have passed and nothing has changed. Then on the other hand you have Bayern. I admit I don't watch them very often (only in CL) and there he gets burned by quick wingers that are good on the ball on a regular basis. On the Bayern forum people are not very fond of him either nowadays. He peaked very early in his career, and was a crucial part of the treble winning team, but after that his magic has worn off. I might come off as a hater, but that my opinion is only based on what I have seen of him in recent years. Like any other player he will be praised when he does well and criticized when he fails to deliver, and a player like him that plays for a class team like Bayern should be measured on high standards. Maybe changing clubs will be good for him, apparently he was an Arsenal fan a kid. I could see him doing well there. Neymar out for 10 weeks with a metatarsal injury. Manchester United it is. Unless Mbappe do a Maradona or something. Is Morata eligible to crush Rube's weakened defense? He can play. They changed the rules . But I'd doubt its gonna be Morata. He will miss open goal from 1m. Hoping another Interista coach to piss off jube this year. Ticket in hand, excited about the match even though we just lost 2 important players in the attack this week. The price increased 3€ since last season. PSG likely to miss Cavani, Verratti and Neymar in the first leg against Man United. I paid a 100 euros just to see Inter Barca from the third tier, so you shouldn't complain. 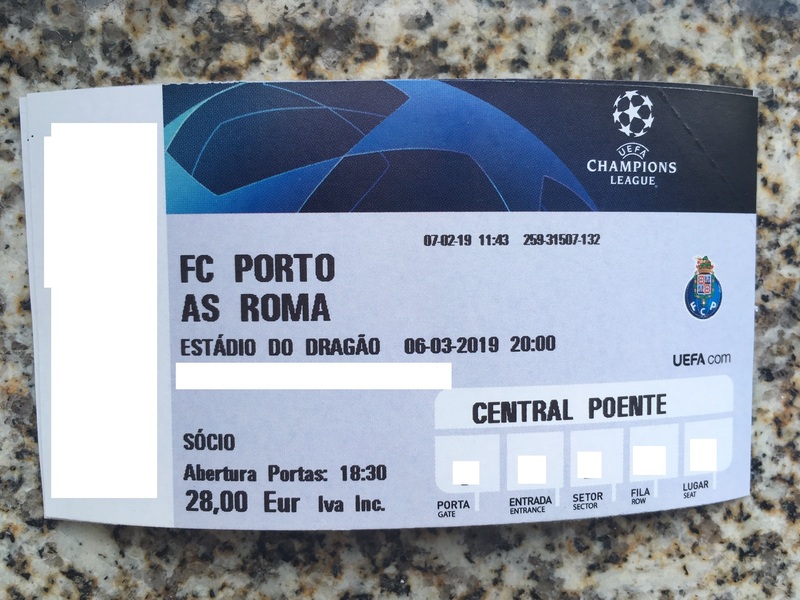 I said that just as a curiosity/to give some perspective, Roma fans have been complaining that 50€ for the ticket is too much, I´m not complaining at all, the only reason why it´s so cheap at the center of the pitch is because I have a season ticket. The price for this area is 28€ for season ticket holders, 32€ if you are a member, 80€ for the anyone else. Last edited by forzainter257; 12 Feb 19 at 09:37. I´m not particularly confident about tonight tbh. We are in the worst form of the season, Marega and Aboubakar are injured so we´ll only have one forward for tonight, when we usually play 4-4-2, Corona (RW) is suspended for the match, We´ll probably play with Otávio there who returned last week after 2+ months injured, Brahimi (LW) has been dealing with muscular problem in one leg for a month now and is severely limited, Danilo (CDM) and one of our key players is returning from a month and a half out, played last friday 90´and was appalling. Herrera has been crap, as usual, and the team is just too tired at this point after playing 9 games in January. We have a decent 1st 11 but we lack depth and our coach doesn´t like to rotate, even in smaller competitions or when the match is decided, the same players play every time until they are injured, same thing happened last season and almost cost us the title, we drew the last 2 games going from top of the league with 5 points to spare to just one point ahead of Benfica, we also lost the final of the league cup on penalties vs Sporting, it´s 3 draws in the last 4 matches against teams much weaker than Roma, I´m not confident at all for tonight. Come on man. All the world will be with ManU on this one. You want corrupt shithead Al Khelaifi and his millionaire boys to succeed over ManU legend Solskaer? Watching ManU is a joy these days after they did cured the Mou's diarrhea.